Persuaded my friends to change their names temporarily to various Russian hero names. (There was a fascinating trend in the Post-revolutionary USSR to name your children after acronyms of patriotic events, such as Vilen (V. I. Lenin). I am now Lorijerik (???????? )which means ” Lenin, October Revolution, industrialisation, electrification, radiofication and communism” Who says communism is dead? Saw basketball for the first time in Guildford. Weird game, everyone looks normal-sized until you chat to them and get a crick in your neck. Also, as always, it went to a ridiculous tie-breaker and one team lost by a hair’s breadth. Crazy game, odd entertainment in the innumerable intervals, but not actually that interesting. Ho-hum. I’ve taken up Squash! By which I mean, I’ve bought a racket and played twice and now hurt all over. Hurrah! Played various games. Shadow of the Colossus is one where you (a small horse-riding boy) have to fight tower-block sized giants (like basketballers) by climbing up them and stabbing them in the vitals. It’s like a puzzle where the level is a moving landscape and you have to reach a certain point. Absolutely awe-inspiring, but eventually repetitive. I’ve also been playing Star Wars: Empire at War, a good solid RTS from Activision involving space and land combat. It feels like Medieval Total War (the dual level, resource-gathering element) and Command & Conquer (2D RTS planet-battles on fixed-path maps), but with Star Wars hero characters. 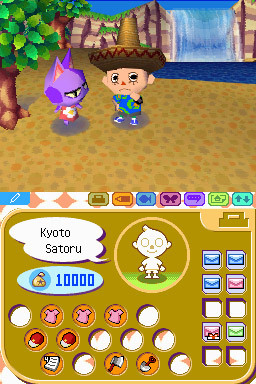 I’ve played the overly-cutesy village-sim Animal Crossing (pictured) excessively with friends, but got fairly bored fairly quickly; limiting your level of social interaction but adding little rarely makes for a good game. I tried playing the vehicular MMO Auto Assault, but couldn’t get even on the server.